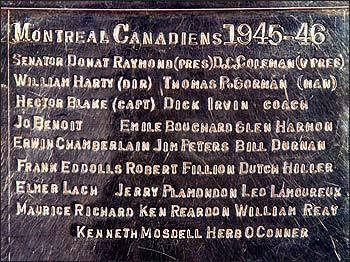 The 1946 Stanley Cup Final was a best-of-seven series between the Boston Bruins and the Montreal Canadiens. The Canadiens would win the series four games to one. Boston defeated the Detroit Red Wings 4–1 to advance to the finals. Montreal defeated the Chicago Black Hawks 4–0 to advance to the finals. Montreal wins best-of-seven series 4–1. World War II had come to a conclusion, and the influx of 40 NHL players returning from military service changed the complexion of the National Hockey League considerably. The Montreal Canadiens finished first for a third straight season, and were going to face the third place Black Hawks in the first round of the playoffs. The other round found Boston being challenged by the fourth place Red Wings. Montreal blanked the Black Hawks in four games to progress to the final, while Boston eliminated Detroit four games to one to earn entrance to the championship series. Montreal and the Bruins battled hard, with three of the games needing overtime to decide a winner. But when all was said and done, the Canadiens were presented with the Stanley Cup for a sixth time. Elmer Lach and Maurice Richard, the former accounting for a series-high seven points, led Montreal in the finals. 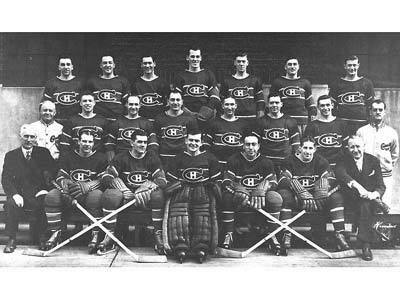 The 1945–46 Montreal Canadiens season was the Canadiens' 37th season of play. The Canadiens placed first during the regular season to qualify for the playoffs. The Canadiens defeated the Boston Bruins in the Stanley Cup Finals to win the Stanley Cup for the sixth time.